V&V supplies complete internal transport systems for your premises, such as the pipe rail and monorail systems. V&V has a wide range of pipe rail trolleys available. supplies a range of manual and automatic electrical tractors for transporting Danish trolleys, harvest trolleys etc. 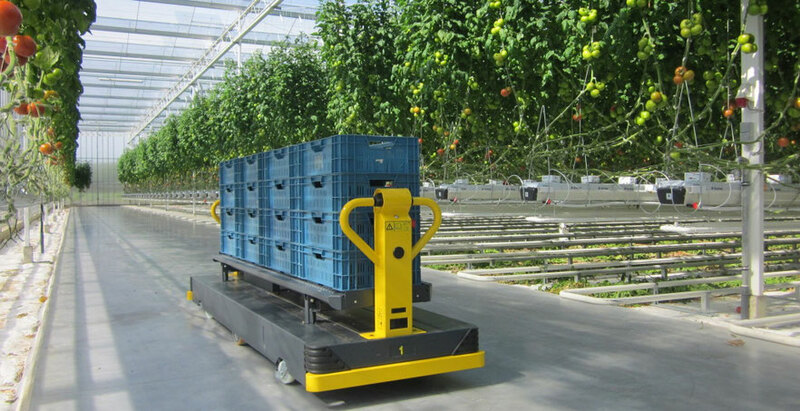 Harvest trolleys include collection trolleys and seated trolleys for peppers, tomatoes or flowers. These trolleys are available in standard and custom sizes. Seated trolleys are intended for harvesting while seated. They can be fitted with a work shelf and sleeve clamp. Spraying wagons make crop spraying a lot easier. They are easy to operate, manoeuvrable and fast to use. The spraying wagons are available in various capacities: 200, 400, 600, 1000 and 2000 litres. The spraying wagons can be fitted with a range of high-pressure pumps and manual or electric reels. Vertical spray masts allow the optimum spraying of upward-growing crops such as vegetables. The spray masts ensure optimum penetration into the crop and are very maintenance-friendly. The spray masts are fitted with a robust undercarriage which can move over ground or along a pipe rail system. The masts are also suitable for mounting on an electric pipe rail car or robot. Horizontal spray booms allow the problem-free spraying of low crops such as potted plants, cut flowers and leafy vegetables. The lightweight spray boom is made of aluminium and fitted with plastic cap holders. The spray masts can be supplied as manually-operated or fully automatic. We can also help with accessories for spraying machines and robots. We supply complete pump and dosing units and pipeline systems. This makes us a one-stop shop for your entire spray system. LVM equipment allows you to turn liquids into a fine mist. The abbreviation LVM stands for Low Volume Mist. LVM equipment is available in mobile and fixed systems and can be used in greenhouse farming, as well as laboratories, industry and cattle farming. The mobile LMV equipment has adjustable range, making the mobile LVM suitable for various spaces. For larger spaces, you may opt for a fixed system with extra fans for optimum distribution. Both mobile and fixed LMV systems have time switches. This means you do not have to be present during the treatment. Fog equipment is mist equipment which can be used for crop treatment, pest control and the disinfecting of spaces. Depending on the product and specific requirements, sorting machines can be supplied in a range of models for the best sorting result. Depending on the product and specific requirements, packing machines can be supplied in a range of models.